Sheep are mentioned in the Bible more than 500 times, more than any other animal. The prominence of sheep in the Bible grows out of two realities. 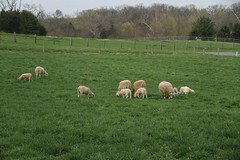 Sheep were important to the nomads and agricultural life of the Hebrews and similiar peoples. Secondly, sheep are used throughout the Bible to symbolically refer to God's people. The very first shepherd was Abel. He was also humanity's first murder victim, slain by his brother Cain. Abraham and Moses were shepherds. King David was the best known shepherd of Bible history. He wrote the beloved Psalm 23. Shepherds were the first people to see the newborn Jesus Christ. The Prophet Mohammed worked as a shepherd when he was 8 years old. 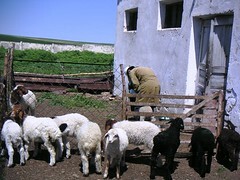 The Bible describes close relationships between shepherds and their flocks. The sheep recognize the voice of the shepherd. They follow him (or her). The shepherd protects his flock and would give his life for them. It is known that animals can instantly recognize the voice of a familiar trusted person. Sheep have excellent memories for faces. They remember their handler. They also remember people who inflict abuse upon them. Christians traditionally refer to Jesus as the "Lamb of God." Many Christians serve lamb as part of their Easter dinner. In many homes, a lamb-shaped cake decorates the table. Many Eastern Orthdox Christians hang pictures of the Easter lamb in their homes. It is well-known to Muslims, Jews, and Christians that Abraham was asked to sacrifice his son. He was willing to do so, but God gave him a sheep (ram) to sacrifice instead of his son Christians and Jews believe that the life of Isaac was saved, while Muslims believe that it was Ismael that was nearly sacrificed on the alter. Jews and Arabs trace their heritage to Isaac and Ismael, respectively. In commemoration of Abraham's willingness to sacrifice his son as an act of obedience to God, a religious festival is celebrated by Muslims worldwide. The festival is called Eid al-Adha. Its English translation is "Festival of Sacrifice." Eid is the arabic word for Festival. As a symbol of Abraham's sacrifice, Muslims (who are able) sacrifice a sheep (or other domestic animal). 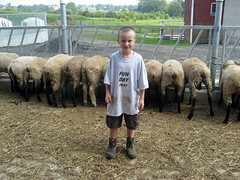 The sheep have to meet certain age requirements (at least one year of age) and quality standards (unblemished). The meat is shared with family and friends and distributed to the poor. The Muslim "equivalent" to Christian Baptism is aqeeqah, which occurs 7 days after the birth of a child. Aqeeqah includes shaving the baby's head and naming the baby. As a symbol of thanksgiving for the gift of a child from God, a sacrifice is performed. 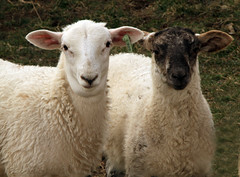 Two sheep which resemble each other, are to be sacrificed for a boy and one for a girl. The meat is shared with family, friends, and the poor. Jacob sheep were named for the Biblical story of Jacob who selected spotted sheep for his flock. 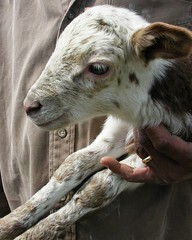 It tells how Jacob took every speckled and spotted sheep as his own from Laban's flock. 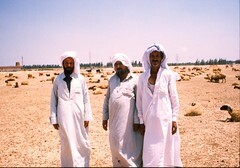 Some claim that Jacobs of today descend directly from the sheep raised by Jacob, that traveled from Palestine to Egypt and to Spain via the coast of North Africa and Morocco. With regards to "judgement day," sheep and goats are used as metaphors in the Bible. Sheep are the followers of Christ, while goats chose not to follow Christ. 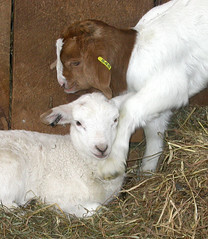 The parable is based on the differences in behavior between sheep and goats. Sheep are gentle, quiet, innocent animals. They do not give their shepherds a lot of problems. They are easily led. Sheep are grazers, unlike the goat, which likes to browse. Goats are rebellious. In the Bible, goats are sometimes used to symbolize evil.